Another new hobby… Knitting. I have rediscovered the joy of making something out of ‘string’. While in Florida, I would crochet. I’ve made several afghans, and some scarfs, and a hat. That is curently being warn by the big guy. I am quite flattered considering this hat was the first non flat, non square thing I crocheted – without a pattern I might add. This is a very long scarf I crocheted while I was in Florida a few years back. I never added fringe, as I like it without. I;ve used this scarf many times since we have been in California. It’s very warm – almost to warm at times, and very thick. I need to make a thinner one. First attempt at a knitted scarf, as opposed to crocheted. I was playing with stitches just trying to get a feel for the big needles and the yarn. I love the look of the knit. Did you knot in knitting there are only TWO stitches. It’s all just a matter of how you use them, and a few other things like increasing stitches, decreasing stitches, etc. Not as complicated as I first thought. Reading the patterns are an entirely different story. It’s like Chinese. Slowly I am starting to understand. Now living in the sometimes freezing climate of the Northern Pacific, the idea of making warm things has renewed my interest in knitting. So off to the store I went to purchase needles, yarn and other assorted knitting related sundries.So here it is folks, my first attempt at knitting a sock. Yea, a sock. It’s done using 4 double pointed needles. Yes, 4 needles.The portion to the bottom of the screen is the top of the sock. Now all I did here is the same knit stitch over, and over again. Traditionally you mix up the stitch in order to create a ribbing. I am not that brave, nor comfortable yet to do the other stitch required. So for now this pair of socks, will be the knit stitch.At least I think it’s going to be a sock. I have not reached the point where you begin to make a heel. Not sure if I am going to try that or not this go around. If not – we have seom very warm ankle warmers. I plan to crochet areound the top to add my own interpretation of ribbing. I will definitely post the finished project. Ok – so I thought my other half was crazy when he started talking about the fish ladder. Yeah, a fish ladder, where fish “jump” up the ladder coming home to spawn. We’ve been to visit the Don Clausen fish hatchery on Lake Sonoma at least four or fives time in the less than 60 days we have lived in Sonoma County. The last time we went we actually saw a few fish “jump”. Not able to get pictures – as that would be nearly impossible. I barely saw them with my eyes, never mind trying to catch them through a lens. Here it is folks – The fish ladder. This is a view looking upstream toward the hatchery. It is this time of year, End of December till March, that the steelhead trout begin heading back upstream to the hatchery to spawn. The ladder and hatchery are open to the public. We plan on hitting one of the tours once the spawning begins in about a week or so. I’d love to catch a photo of the one of these fish jumping – but I do not see how. It happens so fast. Between the ladder and the hatchery itself, it’s about a football field length of river. If you look into the river you can see the fish lining up to go into the hatchery. They are just ‘hanging out’ resting I guess, in some sort of waiting pattern. I guess I’d be tired to if I had to swim up that fish ladder. The last visit at the fish ladder I saw this crazy bird. He was about 3 feet tall, and he let me get so close to him to take a picture. We thinks it’s a heron, what do you think? Either that or a stork – a tsork – can you imagine? It’s so much fun to be near the wildlife. Here’s another picture of him walking toward the damn. He looks like he is in a hurry. Birds are amazing. What amazes me most is that they stay warm out here. Explains why the down comforter is so flippin’ warm. Thank you for the down comforter! DUCKS! I love ’em!At the outflow of the damn, there are a buncha ducks. They all swim around and perch themselves on the rocks in the water. I like the ducks. The color of the birds are amazing. Nature is amazing! One last picture from the hatchery. There are these bushes around here with this bright red berry. They are so colorful, perhaps it’s the time of year, but I love the green and red. So vibrant. Here is a close up shot of the berries and the leaves. Do you know what it is? I have started to fall in love with bird watching. There are so many to watch around here. I have begun putting bird feed out on the railing of the deck. Here are a few of the birds that are visiting. 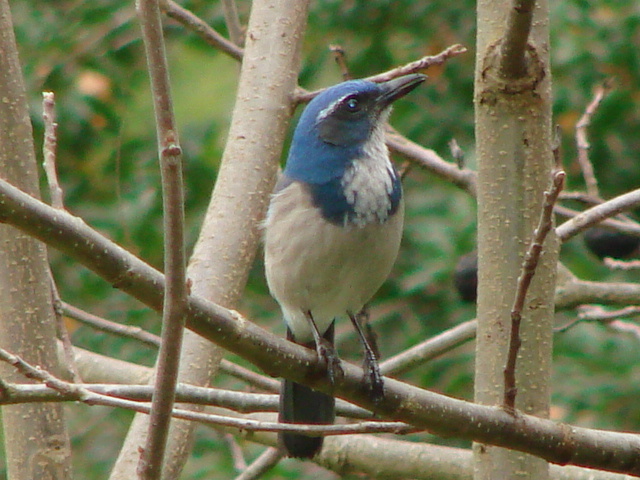 The Western-Scrub Jay. Here he is sitting on a branch. We also see a lot of Dark-Eyed Juncos – they are all over the place. They will stay put while we are out on the deck, as long as we our quiet and still. I want to build a bird feeder to attract other birds. When we first got here, one of the first birds I saw was a humming bird. He came to the deck and hovered about 3 feet away from me, long enough for me to get a good look at it – and he took off. These birds to right I have not identified yet – I believe they are sparrows, just not sure which type. They are not as frequent a diner as the Juncos, but they show up now and then. Our week has been filled with house hunting and work. On one of our outings looking for a Rental Property. We drove by this street in Sebastapol, CA. A little tree lined street with these quaint little house. Picket fences and all, with something a bit more intersting than your normal lawn art… No plastic pink flamingo here. No siree Bob. These people are not fooling around when it comets to lawn art. We’re HERE! Finally – a week of driving and here we are in Northern California, Santa Rosa to be exact. It’s chilly – about 60 degrees. You can smell the wood-burning stoves in action. We’re worn out and I don’t care if I ever see a highway again. No more walkie talkies and driving at 75 MPH. Happy Thursday! We’re one mile from California. We sleep in today, so burnt from the previous day. We are on the road about 10:00 am. 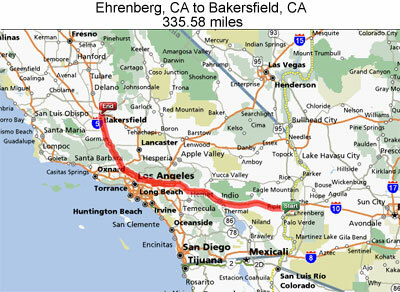 As we cross into California we gain an hour. Yipee! We are stopped for an agricultural inspection, we pass. We’re on our way. We have a good day on Thursday! We take it kinda easy – as easy as driving around LA can be. OH Vey! 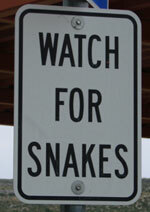 We bypass downtown LA, so it was not that bad. But it seemed to go on forever. Fast lane changing, merging (which can be adventurous when the trailers turn signal fails, or the right side view window is dangling. Nothing a little tap and some duct tape can ‘t fix) We stop for refueling and potty breaks maybe twice. We finish our day on the steepest grade yet. 6 miles down the side of a mountain. Did I mention the darkness? It was a wild ride, 18 wheelers and US going 35 miles an hour down this HUGE mountain side. I was ready for some vallium and an undergarment change by the time we reached the bottom. I am excited, and tired and ready to relax and find our new home. I will write more this evening – or possibly in the morning. Time to go now andget this trip over with. Day 6 – It must be Arizona! Wow – I am a few days late updating the blog. It’s been a CRAZY couple of days. The travel has worn me out. Somewhere in the middle of Arizona, my top blew and the steam came out. I felt much better after that, let me tell you, packing all of your crap into a truck and hauling across 3000 miles is STRESSFULL! After all the crazy driving in Houston, Mobile, and every other rush hour we have experienced, driving across western Texas was a DELIGHT! Flat, desolate, some traffic, but not wheel gripping, heart pounding driving. I could actually look to the left or look to the right. Out of Texas and into Arizona, WOW – what beautiful land. And Dry! Apparently the dessert is very dry. I have discovered the definition of parched. I never thought I’d pine for humidity. In an effort to avoid Phoenix traffic, we took the I-8 Phoenix Bypass. This bypass took us right through the Saguaro National Park. WOW we WOW WOW! The land of the great cactus. HUGE cacti all around us. I wish we had time to stop and really have a look, but we had to keep moving. Definitly a place for future exploration. Not to mention the Grand Canyon and the Sultan Sea. To get back to the I-10 we had to get off I-8 and catch hwy 85 North. HOLY CRAP Batman! We saw signs for a hotel, our intention was to stop at this hotel – time approximately 5:00pm. Well, we missed the directions to the hotel , and ended upon Hwy 85 north (this is a good thing), it was pitch black, two lane highway, 18 wheelers behind us and 18 wheelers coming at us – just across the diving line (this not such a good thing). This was an insane white knuckle ride. I am not religeous but I was praying to EVERYONE! Just let us get through this unscathed. 30 miles or so later we re-connect with the I-10 and head west. Our plan was to get the first hotel we saw. By now it was dark and cold and we were exhausted! First hotel room we find is outrageously priced due to some NASCAR event in Phoenix. CRAP! 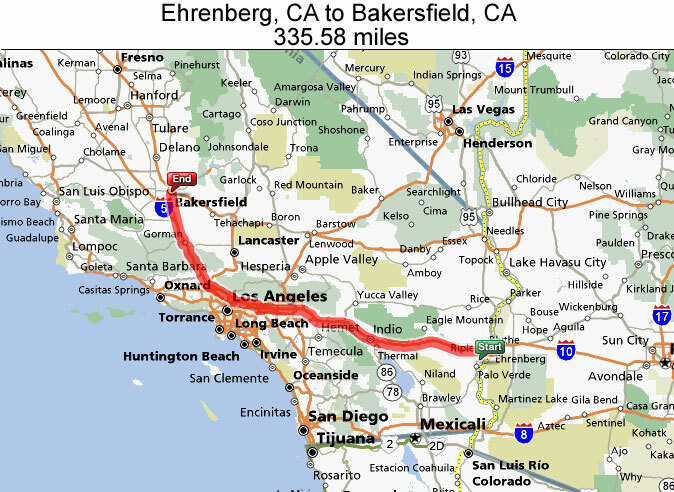 After much debate and a 12 mile trip backwards toward Phoenix, we decide to drive the 112 miles to the California border. It was dark, and we were tired but we made it safe and sound. 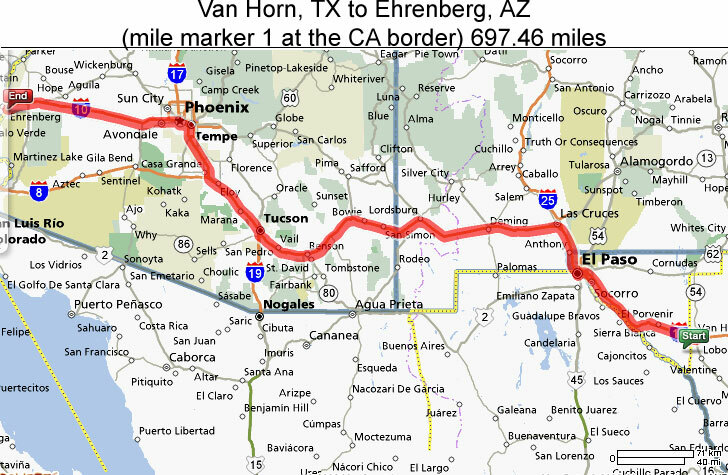 A town named Ehrenberg, AZ its the the 1 mile marker at the border of Arizona and California. We can see California from here. 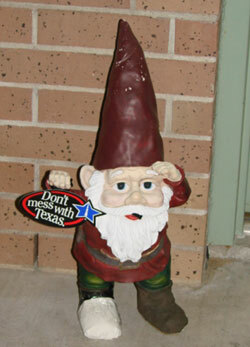 Day 5 – Texas, enough said! We started out bright and early – on the road at 5:30am. 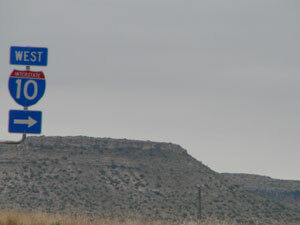 Our goal was to get to El Paso for the night. All was going well till we hit San Antonio, and there was amulti-car accident. We sat in bumper to bumper traffic for over an hour. This totally messed up our time for the day. What may have taken us 20 minutes to get through – cost us 90 minutes. Other than the traffic delay in San Antonio, we had a very good day. 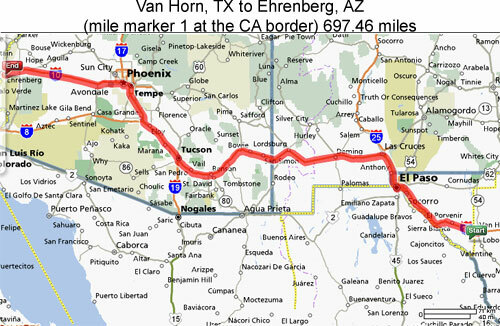 We made it to a VERY small town, Van Horn, TX – population 2,435. Just shy of our goal to El Paso. We blame San Antonio. I am too tired to write any more.. Maybe tomorrow. Here are some pictures. Day 4 – Fog, Bumps, Birds & Bar-B-Que & FOG! Our first obstacle of the day was pea soup thick fog, WOW! I now see why people have accidents in the FOG. I also thought that was a bit odd, not anyone. I’ve included an artist’s rendering of the FOG! See it here on the right. .. What? You can’t see anything? Neither could we.. we battled it for about 2 1/2 hours. No need for caffeine on this trip. Just drive for a couple hours in the fog! Louisiana has HORRIBLE roads! We were bouncing all over the place. Talk about holding on for dear life. I’ve never seen anything liusy with like it. Driving over the Mississippi river was an amazing experience. I wish I could’ve seen it I was too busy with my eyes glued to the trailer and my hands firmly wrapped around the steering wheel. Blisters, I am getting blisters on my hands from gripping the wheel. Next up Houston, OH VEY! 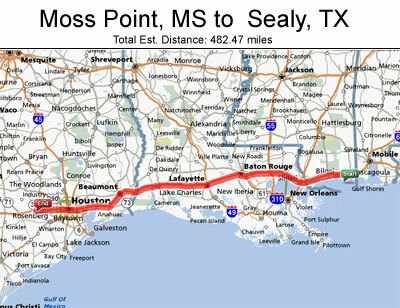 Mobile was rough – then we look at the map for Houston and it looks like a big bowl of spaghetti. We tried to plan it so we did NOT enter during rush hour. We go there about 4:00PM. *sigh* I am sweating bullets by this time. It took us about 1 hour to get through, it was CRAZY – a ton of traffic, but not as stress full as that Mobile Bay Bridge. Maybe we’re just getting use to it… NOT! We are currently resting in a small town just west of Houston,TX. 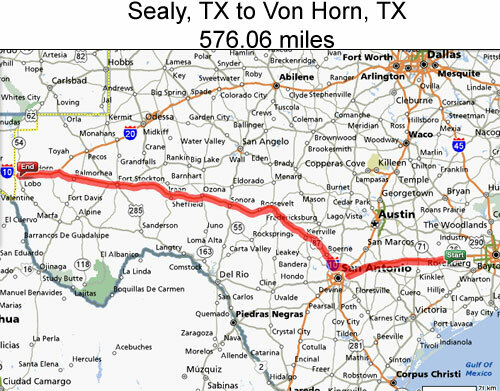 A place called Sealy, TX ( population 5248). We had our first taste of Bar-B-Que for dinner – it was ok. We’ll try some more tommorrow. We oull in the shell station to fill the cars up for the next days drive. And there must be 300 birds overhead on the powerlines. The guy in the shell station said it happens 2 times every day, once in the morning, and once again durring dusk, It was amazing. We took a video of them and a still shot. 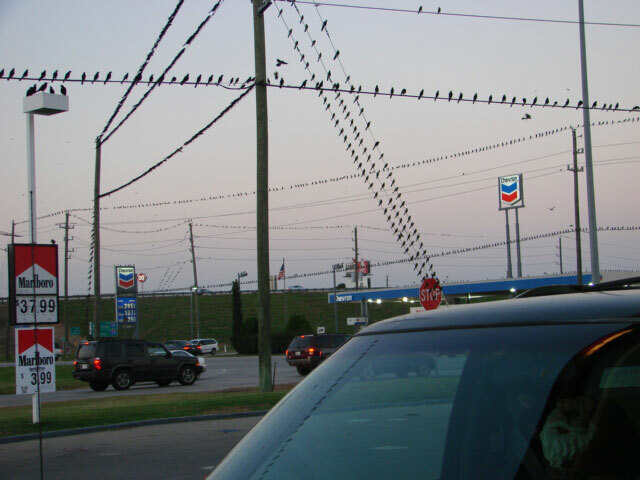 Here ya go… I was so messmerized by the birds, I over filled the gas tank in BMW, and poured gas all over the place, including my sneakers and socks, OY! I am such a mess up sometimes. 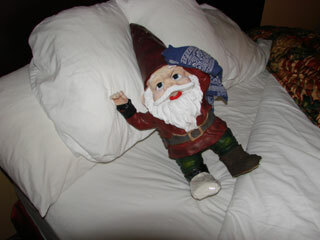 Day 3 – The gnome’s misadventures.. Nothing very exciting to report. 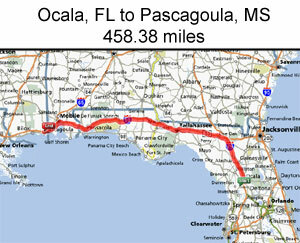 We’ve made it into Mississippi, Pascagoula, MS (population: 23,719 Current temperature: 51 F) . It all started at a very large bridge. The posted Speed limit was 40 MPG. The crazy people were going at least 55MPG! From what iI can tell, it’s the Mobile Bay Bridge. It’s not like I had a chanceti read a sign or anything! Have ya ever heard of white knuckling it.? Let’s just say I am developing blisters on my hands from holding the steering wheel s o tight. I am truly convinced I can drive anywhere after today. Don’t let this pretty picture fool you! It was an insane. ride over the bridge. Not to mention, the tunnel at the end, the crazy lane changes to keep on I-10, the laggin motorists , that caused the trailer to brake in he middle of all of this insanity. 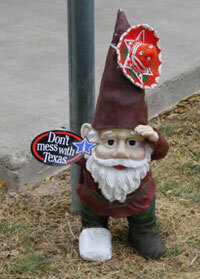 The gnome is resting comfortably after some minor surgery – poor guy took a tumble out of the truck as we opened the door to repair the dangling side view mirror. Oh did I mention the mirror is being held on by duck tape and a prayer. So far so good! And of course the trip would not be complete with out a little electrical issue. Nothing major,just a bad connection on the right blinker of the trailer. Did I tell you? We are communicating between vehicles via walkie talkies. Apparently they’re battery life is not as long as our driving time, They ranout of juice about an hour before we did. Some minor bumps and bruises (course the guy driving the trailer would beg to differ that the bumps in the road have been minor. Well, its late and we’re tired. I am off to sleep.